"In God We Trust, All Others Need Data"
Lot's of talk these days regarding transportation problems. Many of us ponder what's going on while we sit on I-84, Eagle road or Meridian road waiting for traffice to move. I think it's important to understand a bit better our transportation funding systems, how it's setup, how/what GARVEE really is and how all of it is managed. Many don't realize the IDT covers all state transportation needs; roads, aeronautics, bike paths and public mass transit. We will focus on the highway funds as this is where the bulk of the funding goes and where the majority of our issues currently are. Funding for most of this comes from our fuel taxes (.18 fed and .25 state cents per gallon of gas). State taxes along with registration fees are placed into what's called a "Highway Distribution Account" or HDA. For 2008 state budget year (we are in now), the projected funds that are to be placed into the HDA will be ~$333M. 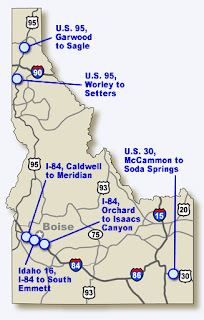 From here, funds are sent to various entities as required by the Idaho Constitution: Local highway jurisdictions (county, Assistance Council, Cities and Highway Districts) receive 38% for local infrastructure operations & repairs, Idaho State Police receive 5% for operations and training. The remaining 57% goes to the ITD operations account as general funding. It should be noted that there are some funds "taken off the top" for things like administration, bridge inspections, rail crossings and fuel tax refunds. This distribution into the State Highway account is then combined with the federal dollars that we receive back from our .18 cents per gallon we pay. We receive ~$1.34 for every $1 we pay in federal gas taxes back from Washington D.C. due to the diligence of our federal Legislative team. Other states like NY, CA, IL and others receive back less than they pay, and fight for more funds annually... having good folks representing us back in D.C. is critical with regards to these types of arm wrestling matches. Without the strong positions that we have now, we are at risk of loosing much of this funding. The federal funding (~$300M) combined with some other misc. funding will bring the State Highway Account to ~$525M for the 2008 that ITD uses to manage operations and maintenance costs of our infrastructure. Every year, the State Legislature looks at how ITD proposes to spend these annual funds to approve/disapprove dollars spent on various targeted projects. The objective is to ensure the "people" have a say in where we get our "bang for our bucks" through the checks of the legislative process. Every year, internal ITD infrastructure upgrades are a part of this budget. We must ensure that the department charged with obligating the annual funds and getting "asphalt on the roads" has the capability to do just that. The GARVEE program is a legislatively approved authorization to sell "bonds" (a way of borrowing money) to fund for special projects up to $998M. The first year of approved Idaho GARVEE bonding was in 2006 (for the remainder of 2006 and 2007 year's budget) where $200M was authorized by the legislature for bonding. This obligated the state to use State Highway Account funds to match currently available federal funds to pay off the interest due to the bond holders over the terms of the bonds. The objective of using GARVEE is to "borrow" funds where it makes sense to purchase items for infrastructure growth that you know will increase in cost over time. Return on Investment (ROI) must "pencil out" or be deemed as a "good investment" for the people of the state before bonding (borrowing) is authorized. An good example of GARVEE use, would be for the purchase of easements for new roads or interchanges. With the increasing costs of land, it's wise to plan early in purchasing those easements as far in advance as planning allows. (preliminary planning is required prior to any GARVEE bonding request just to understand how much bonding is required). We all should realize by now, that pretty much the cost of everything increases over time (unless we can figure out a way to start buying pre-made highways from Wal Mart... ;-) ), so using the reasoning of "we need to buy it now because next year it will cost more" really would be abusing the tool as it is intended. The interest payments on these bonds obligates future funds from our State Highway Account that our children will be counting on for their future transportation maintenance and construction costs. We don't want to get ourselves in a position of using more Highway account dollars to pay interest vs. putting down or repairing hard-pack! We are now betting that we will always receive our $1.34 per $1 in fuel taxes sent to the feds back into our account to cover the cost of the bonding interest payments... how long that will last is any one's guess, but my bet is not much longer. Almost all states in the nation are now in a highway "funding crunch" due to many factors. The biggest is the increased fuel economy of cars. More road miles driven on less fuel means less taxes paid to the states and to the feds for infrastructure upkeep and build out. The available federal highway funds will continue to have more and more pressure applied to help out all 50 states, that availability of future funds for the next 10 years are questionable at best. Some say 2010 is the year the funds will go upside down, having more costs than revenue available. We are now at a critical juncture of what to do next: do we cut back on our infrastructure costs or increase our taxes to cover the costs we currently have identified? I believe we need to do a little of both. We have an ITD internal infrastructure that needs some self evaluation on how and why it spends what it spends. Almost every year the legislature approves funds for "technology" upgrades for all departments that will "allow us to do more with less"... but we never seem to get to the "less" part? Every organization needs a periodic "self look", "houseclean" or "evaluation"... whatever you would like to call it, it's time for a good look at our internals. A good look would really go a long way in gaining back lost credibility of a department known for being an organization looking for, finding and executing programs with the people's money that got the "biggest bang for the buck". We are told by ITD that we are behind ~$250M per year in spending due to costs going through the roof across the board. Our ITD sites some excellent examples of these increased costs on various projects around the state and also provides examples of less funds per miles driven coming into the HDA. Considerations for better engineering and materials used over the years are not included in any documents I can find. One would think that pavement laid today would be better/stronger than that of 20 years ago and would be expected to last longer as well. One would consider better safety designs in both cars and trucks and our newer infrastructure would be reducing damages that should also reduce needed repairs. I do believe we are behind in funding for infrastructure, but I'm not convinced that the currently published numbers tell the whole story. In March of 2006 Gov. Kempthorne's office brought the first GARVEE bill before the House asking for $998M total to be allowed authorized for the "Connecting Idaho" project. This was approved as was $200M bonding authority for 6 specific road projects (two of which were: $70M for I-84 from Caldwell to Meridian ,and $13.9M for resurface/widening of I-84 from Orchard to Isaacs Canyon). This bonding authority was approved above the standard $500M+ of the ITD annual Highway Account budget (bill H0854) for a total of over $700M for the remainder of 2006 and 2007 (GARVEE) bonding. One year later (in March of 2007) when ITD brought the second GARVEE bill before the House, the full $200M of the initial "selling" of 2006 bonds had been completed. The state (out of the ITD annual 2006 State Highway Account) paid ~$700k in bond matching funds interest, while only obligating (spending) ~$51M of the $200M in the 12 months from the initial approval. There were a number of questions as to why the remaining funds from the bonds had not been obligated and the summary conclusion was ITD was overwhelmed by the amount of money/work required for obligation of those funds. They then contracted with Washington Group International to "help them manage the projects and funds". As of March of 07, legislative research found that the $51M that had been obligated was for "soft" goods like studies, planning and administration. Not a dollar had yet been spent on the ground, and there was still $149M in the "bank" that couldn't be spent for easement or other items because there just weren't enough "hands moving in unison" to make it happen. With ITD still having $149M in hand that was not yet obligated to put roads on the ground (that interest was being paid on), there were some very hard questions being asked by the legislature of ITD and WGI; with regards to the rates being paid to WGI for "management assistance", when something "hard" was going to hit the dirt and what were the intentions with the remaining $149M that we were obligated to pay interest on. In April of 2007, when the Legislature was being asked to authorize yet another $250M in bonding authority for the 2008 ITD budget, there were grave concerns with regards to having the ability to obligate, moderate and control such funds. Sighting the example of the first $200M that couldn't be spent to that date from the 2006 authority on transportation projects worried many Legislators. The 2007 bill (H336) asking for $250M more bonding authority was finally passed with many restrictions on just when the bonding could be completed and for what. I truly believe that none of us in the House are of the mind that extra money doesn't need to be spent to upgrade our infrastructure, most of us are more concerned that we don't have an internal infrastructure in place to spend the kind of money that we have already thrown at the problems. This lack of ability costs us interest out of our annual Highway Account to pay on the bonds already authorized. Might we be able to spend this interest money better elsewhere in the system. It also costs us in having to "purchase" infrastructure to help obligate these funds. As an example, the 2007 H0336 bill authorized to transfer up to $7M to pay the debt service (interest) on the GARVEE bonds issued thus far. As we increase our GARVEE bonding, we are obligating ourselves to pay more and more of the interest on these bonds from the future tax dollar revenues that we are dependant upon for our future transportation obligations and needs (again, our children's transportation infrastructure money). Today I had the pleasure of joining Gov. Otter, ITD, local legislators and others involved in our GARVEE projects at the Isaacs Canyon overpass on I-84. The objective was to kick off the widening/resurfacing project that was authorized and signed by Gov Kempthorne in April of 2006... 17 months from the time of authorization to "kick off" of a $13.9M project that we are paying interest on... is just frustrating. I received a letter today from our ITD District 3 Commissioner that another GARVEE bonding will be proposed to the Governor to include in his budget for the legislature in 2008 for $134M. This will include over $60M of additional funding needed for the Meridian 10 Mile Interchange project. I am not yet aware of what the remaining bonding will be requested for. We must get 10 Mile done next year for the safety of our citizens and economic growth of our city. In case the Governor or the Legislature decides we are "far enough out on this GARVEE limb" and doesn't approve the new bonding, we must have a backup plan for completion. Marv grew up in Northern Idaho on a farm north of Moscow. He went to school in Potlatch and entered the Navy in 1974. After 20 years in the Navy, Marv came back home to Idaho to work in the semi-conductor equipment manufacturing business. Along the way he started his company The Hagedorn Group, Inc (www.thg-inc.biz, now one of America's largest equipment import brokerage firms) and is now working as full time CEO. Marv is the Idaho State Representative for District 20 in Meridian, Idaho.